Vietnam’s benchmark VN-Index slightly fell on July 20 as investors were cautious amid conflicting movements of international stock markets. 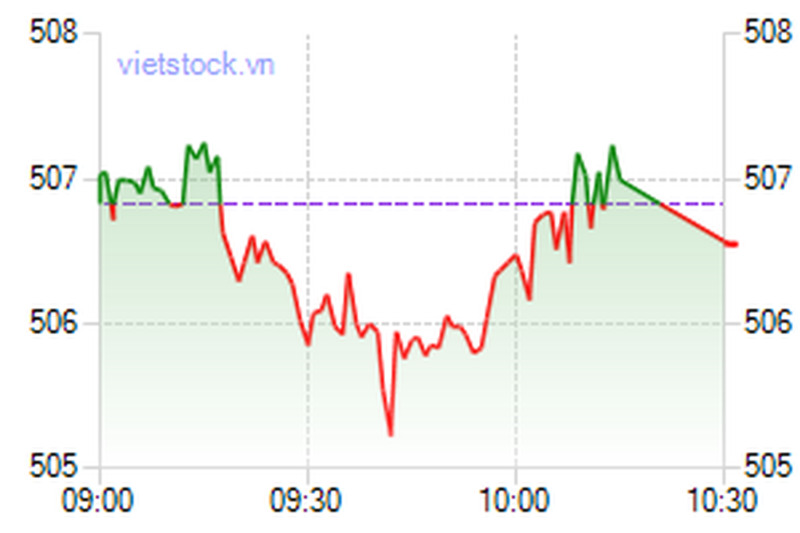 VN-Index continuously surprised investors by changing directions at the end of the trading session. Penny-stocks still attracted investors as most blue-chips had not showed signs of recovery. The measure of 247 companies and four mutual funds listed on the Ho Chi Minh Stock Exchange slipped 0.06 percent, or 0.26 points, to close at 506.56 points. Of the index, 97 stocks gained, 108 declined, while 46 treaded water. Around 47.75 million shares, worth VND1.4 trillion, changed hands on the city bourse. Ocean Group Joint Stock Company (OGC) was the most active stock in volume with 2.25 million shares changing hands. The company announced that Ms. Ta Thi Thanh Thuy would be the company’s deputy general director and that Mr. Hoang Van Tuyen would become chief financial officer and chief accountant, replacing Ms. Dang Thi Hong Van as of July 16. Ninh Van Bay Real Estate Joint Stock Company (NVT), which led the winners on the city bourse today with a rise of 4.96 percent, came in next with 2.24 million shares. Saigon Thuong Tin Commercial Bank or Sacombank (STB) followed with 1.72 million shares being traded. Vietnam Electricity Construction Joint Stock Corporation (VNE) tumbled 30.61 percent to VND17,000. The company will issue 6,344,216 shares to pay dividends for its current shareholders at a 20 percent ratio. It will also sell 25,376,864 shares with a ratio of 10:8 and a price of VND10,000 per share. Godaco Seafood Joint Stock Company (AGD) dropped for the fourth day, losing 4.85 percent to VND35,300. Viet Nam Land Investment Corporation (VNI) dipped 4.61 percent to VND26,900. Electronics producer Alphanam Joint Stock Company (ALP) gained 4.95 percent to VND23,300. Hanoi-based construction company Lilama 10 Joint Stock Company (L10) advanced 4.9 percent to VND40,700. The smaller bourse in the north continued to finish in the red, as the Hanoi’s HNX-Index lost 0.22 points, or 0.14 percent, falling to 160.15. 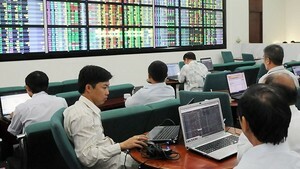 Trading volume improved as nearly 49.8 million shares changed hands at VND1.4 trillion. The UPCoM-Index of the unlisted shares sank 1.4 points to 57.02 points. A total of 647,100 shares were traded at VND14.14 billion, as of 11 am local time.